Situated in Assam, Majuli is the world’s largest river island . It is a fact, that the mighty river Brahmaputra every monsoon claims a part of it and in another ten years or so, the fragile island may not exist. The Mishing tribe that live here have a loom set up below the bamboo stilts of their homes filled with vivid colours which makes it one of my favourite places in the east of India. Lush green, ponds in various sizes, indigenous local materials used for most of the structures including bridges where vehicles ply, adds to the aura. There are no shows of opulence and people lead a very simple rural life. Everyone has time to chat about their families, fishing , weaving and have their picture taken. My ride, crossing over on the Bamboo bridge. 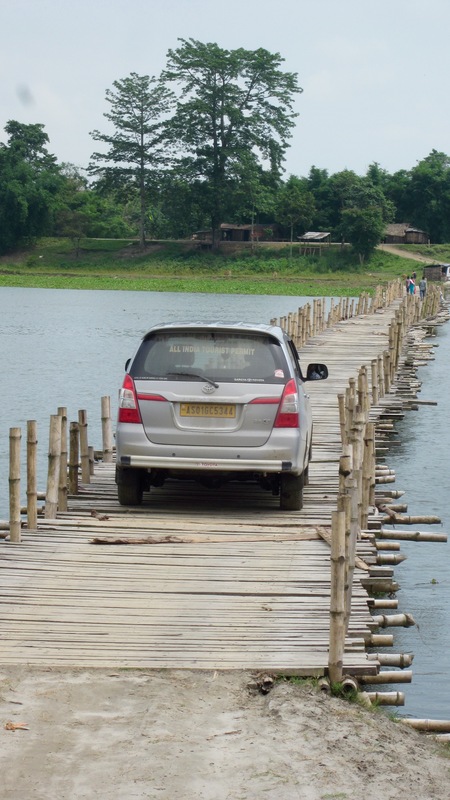 Every year this bridge is reconstructed after the monsoons in Majuli , Assam. A sense of tranquility that is unique to island life the world over, helps visitors like myself slow down and unwind. Perhaps this is the reason the important Satras are located here. Satras are monastic institutions, that were initiated by the social religious reformer Sankardeva around the 16th century. 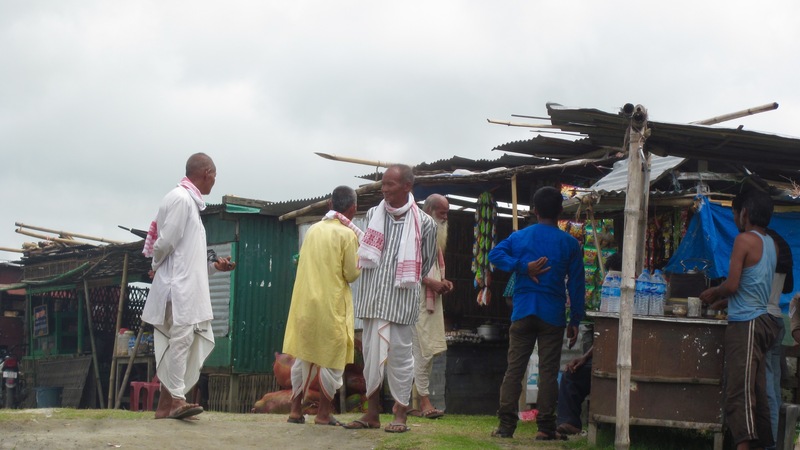 One of these is the Samaguri Satra and is known for its contribution to the arts. Here along with mask making, they teach dance and music too. The traditional form of mask making uses thin strips of bamboo and cane to form the basic shape on which mud is plastered, layer upon layer. They use natural colours derived from plants and stones. Interestingly, the stones used for producing the required red and yellow colour, come from Rajasthan. The reverse of the mask shows the cane frame work on which the mask is modeled. Hem Chandra Goswami, Guru of the Satra describes it as an educational Institute for art and craft. 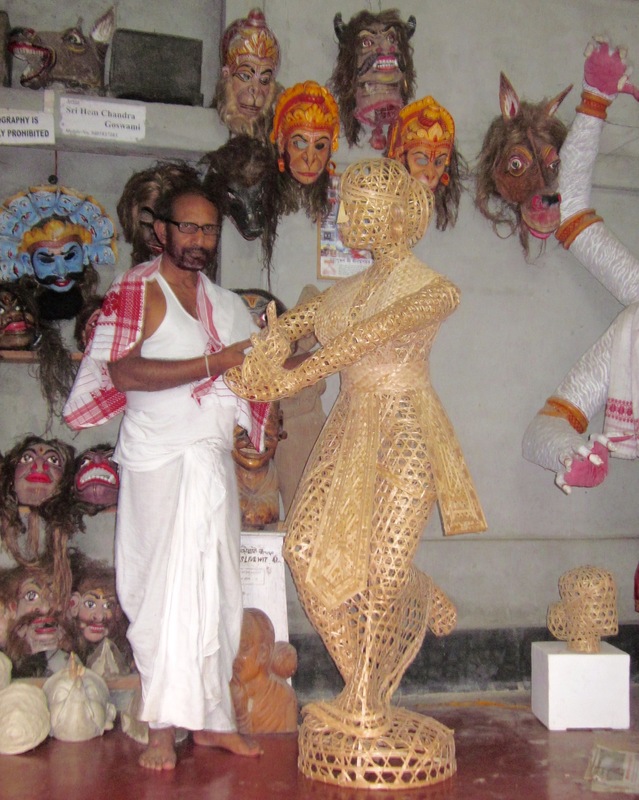 For over 35 years, he has taught a large number of students how to make the traditional masks used in Bhaona, a folk theatre form, started by Sankardeva himself to spread his message through religious plays that he wrote for people to understand what he was preaching. Hence, the themes for these plays center around the Ramayana, Krishna Lilla and the Mahabharata. In the compound of a Satra, looking inside a naam ghar, the chanting room which is the nexus of life in a monastery. 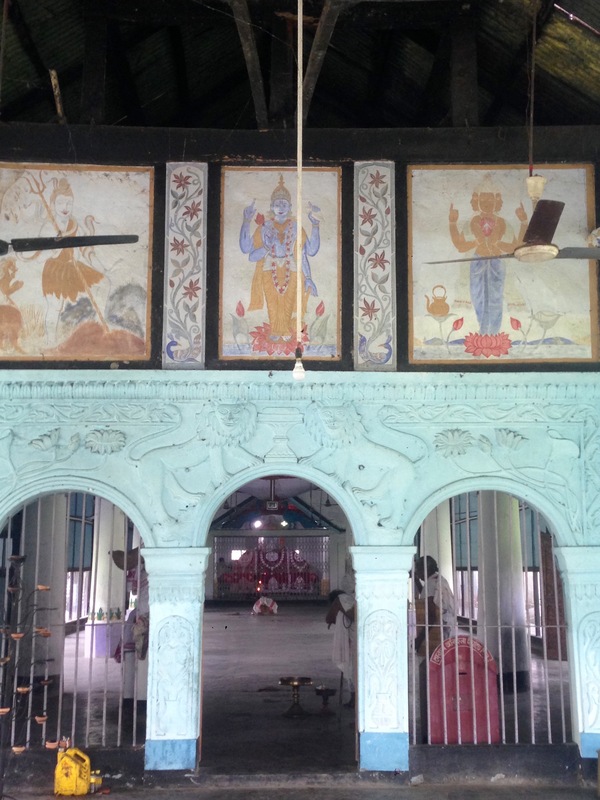 The murals on top depict the main Hindu gods, Shiva, Krishna and Bhrama. 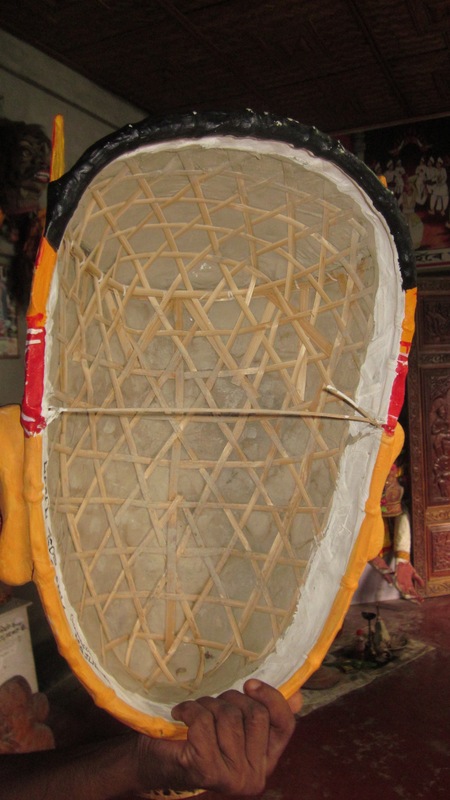 A skilled mask maker himself, Goswami has innovated on the craft that has been passed down generations in his family. He has created a series of masks that provide mobility to the jaws of the mask and in some cases to the eyes too. This makes the mask more realistic when the actor wearing it speaks . He had a senior student of his demonstrate this by putting on various masks and doing a few of the actions that provided the best examples. It was for these innovations that his masks were exhibited at the British Museum in London in August, 2016. It was part of a bigger event that displayed fabrics woven in Assam with patterns portraying scenes from Lord Krishna’s childhood under the counsel of Sankardeva himself. He showed me a book that was published to mark this exhibition at the V& A museum. The publicity has generated an interest for this art that is part of our heritage, but it still needs a lot more patronage. He is rightfully very proud of this achievement that has added to his impressive resume. He is also a skilled make up artist and has choreographed traditional plays to appeal to more modern taste. Given that his training has been steeped in very conventional traditions, his outlook is far-sighted and refreshing. He wants the art to move beyond the traditional theatre form and find a place in the larger more contemporary world so that his students are able to nurture and pass it on. He is open to collaborating with artists from other disciplines and giving demonstrations of the techniques he uses to create the mask. He is using the same techniques to create sculptures and believes that when you keep an open mind, new ideas and work come. Goswami with a sculpture that he is working on inside his workshop. Hem Chandra Goswami has always kept the doors of his school open for anyone interested to come and learn. 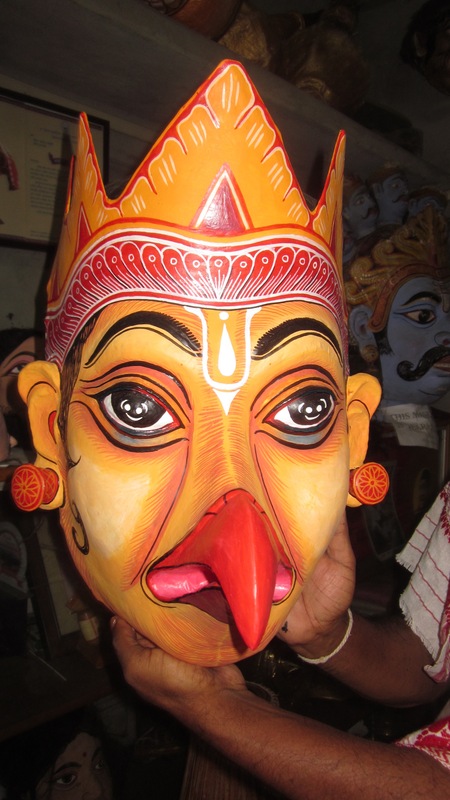 In the past he has had students from across the globe come and spend time at his Satra learning mask making and the theatrical movements required to perform in them. He used a term – Gurukul Vidya to describe this and explained that it meant that if a student approached him who has earnest and willing to learn, he considered it his duty to teach. An unassuming man with a deep passion for the craft, he mentioned many times in our conversation that he wants this old art form to be preserved and practiced by generations to come. He was as enthusiastic to show me the works of his ten-year old students from a nearby school who come in a few times a month, as that of his older students who have been learning and working with him for over a decade. The young ones he encourages to do any type of mask they want, play with colour and shape. He feels that the exploration is vital in creating an interest. The hour in his company flies by and I am left infused with his passion and make plans for my children and me to participate in his workshop next summer. I found some of his interviews online and the link below is to one of them, which provides a good in depth to the master and his world. Image courtesy – Author’s own.